I feel like every time I make a post lately it's about how i'm sorry I am not a better blogging. Maybe if I knew anyone read it I would be more likely to keep up.. Anyways-- What's going on in my world is that all I do with my TV time now is watching Food Network Channel. I have been really into the Pioneer Woman... but I actually didn't really like her Beef Stroganoff recipe... So I found Paula Deens... Maybe I was over critical... or expecting something amazing.. my audience enjoyed it more than I did. I would make it again but probably try a different one before I made this one again. I bought my beef steak strips from Publix (it's the only thing I bought from Publix) I believe I got it for under $7.00. There was a house seasoning Paula made and it consisted of (1 cup salt, 1/4 cup black pepper, & 1/4 cup garlic powder) I didn't use it. 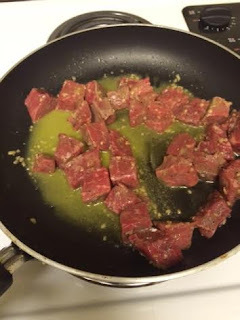 I placed the steak in a wooden bowl added salt, pepper, and minced garlic that was in a jar, about two table spoons of that and a generous portion of salt & pepper. I let it sit for a few hours in the refrigerator until I was ready to cook. 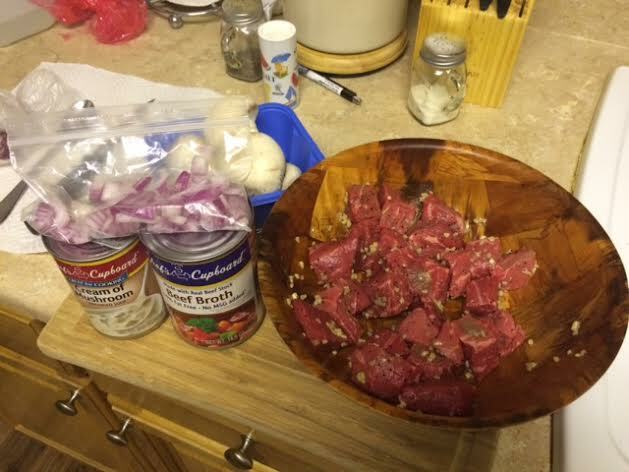 Before I started cooking the meat I chopped up some onions ( I got 6 for $1.50 at Aldi, along with mushrooms) I chop everything before hand and then started the skillet. I place the meat in the skillet I put the olive oil in and the butter, throw the meat in add a few sprinkles of flour to the mix; I brown them on both sides( I think next time I will leave them more pink). Once brown I take off put on a plate set aside. I put the onions and mushrooms (both chopped) back into the skillet, with the beef "fat", cook them until tender I added a few sprinkles of flour to this mix. 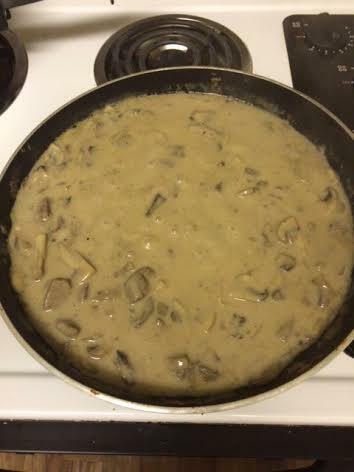 I then added the meat back in, then added the mushroom soup and beef broth, I left on 2-3 heat for 30 minutes; added salt and pepper along the way. I let simmer for 30 minutes, but I start warming the water at 10 minutes and put the noodles in at about 20 minutes; When I put the noodles in I put the sour cream in the sauce. When I first saw the sauce I thought it was too liquidey but it was perfect for the noodles. I make sure everything is mixed together perfectly. drain the noodles and everything was ready to go! Put the noodles in a bowl and add the sauce! 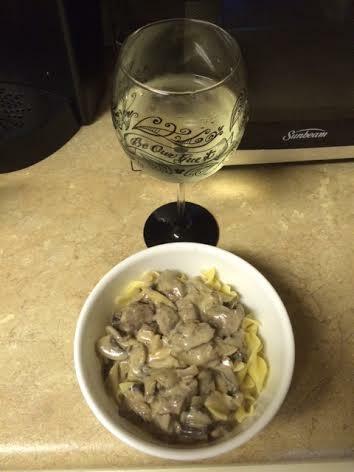 Of course I poured myself a glass of wine! I would make it again but i'm not totally sold on the recipe! Here is the actual recipe if you would like to try it!